There has been discussions among the local farming communities that ranchers have met to discuss access to their horse properties so that Marijuana growers can set up and grow crops to keep up with the demand of the local marijuana shops in Colorado. The state has seen a massive influx in the purchase and consumption of Marijuana since making it legal a few years back. Now there doesn’t seem to be enough local farmers growing to meet the demand of the public. Tourism into Colorado has also brought in visitors from around the world to smoke some of the finest grass on the market. There is a Colorado dispensary that sources local product from farmers in Boulder and the surrounding areas. These crops can not produce enough product to meet the demand needed to supply all the dispensaries in the area with enough green to keep everyone happy and high. The varieties and strains of marijuana that are available to local consumers are like never before. Seeds are being imported from around the world and grown locally in Colorado. Dispensaries are not only selling the flower, but also variations of the candy, vapor oils, and various other edibles. it’s never been more convenient to be a consumer of cannabis products including CBD oils and other variations of the extract. Farming lands are in high demand because of his and horse properties seem to be a viable option for those lookin to find private lands to grow on. 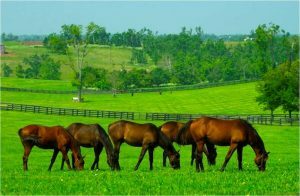 Horse properties have typically profited from renting out their field for horses to roam and graze in an open range environment. Obviously the crops would need to be protected from the horses as grazing on weed would leave the horses happy and the crop owners angry. Keeping other natural predators at a distance would be the job of the caretaker of the plants and not the property owner. This seems like a reasonable solution to a new problem. We will monitor horse and farming communities in Colorado and update you as this develops into a story.